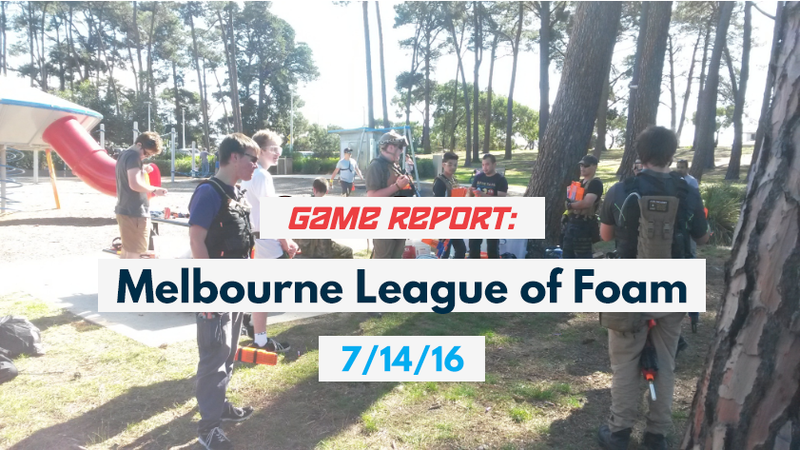 Another MLF event, because of the shields there was a lot more grenade action. 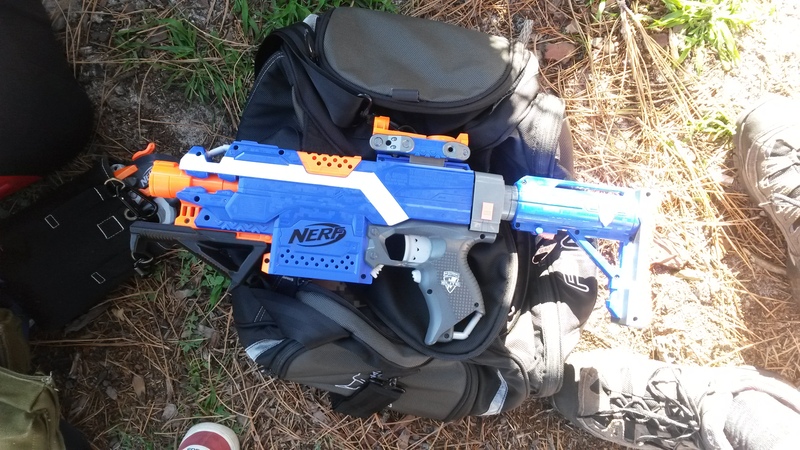 I also got a good amount of experience with Worker wheels in my Bullpup Rapidstrike, and tried out my Demolisher with MTB Honey Badgers. If a player is hit with a dart, they are downed (“hit” and “downed” are often used interchangeably). When downed, they can choose to wait for a medic, or go to respawn (if the gamemode has respawns). If the downed player chooses to respawn, once they move from their spot they can no longer be revived by a medic. Capture the Flag – classic gamemode, obtain both flags at your team’s flag post to win. When hit while holding the flag, drop the flag as well as being downed. *NEW RULES* if both flags are taken, the game enters a sudden death mode with no respawns. 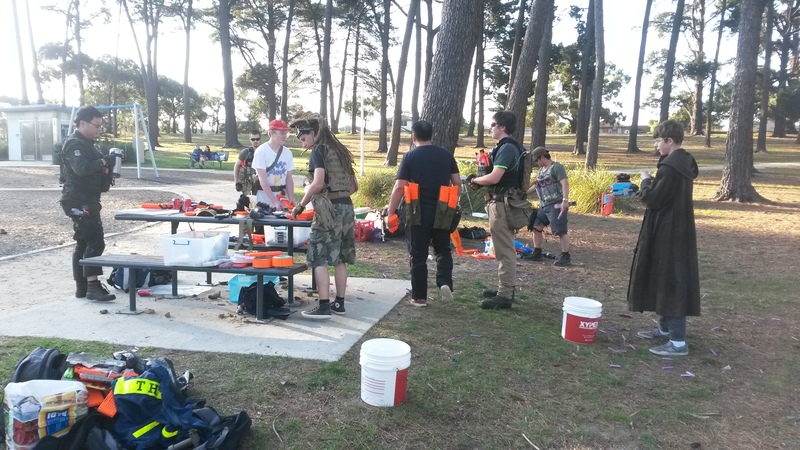 Black Hawk Down – assymetric gametype with two teams: the smaller Special Forces (SF) and larger Insurgents (who often go by a variety of less politically correct names). The SF win if they eliminate all Insurgents. The Insurgents win if they eliminate all SF, or capture the SF’s flag. The SF players are all medics and instantly revive with a tag, while the Insurgents have a single medic who operates on ordinary medic rules. *NEW RULES* An Insurgent melee attack is a suicide attack and eliminates both the SF and Insurgent. 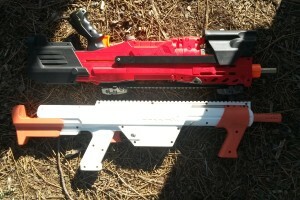 I had my first combat experience with Worker flywheels in my Bullpup RS, and it performed exceptionally well. Grouping seemed to be significantly better, I was getting a lot less spread even at longer ranges, allowing me to actually get a lot more hits at longer ranges. It may have been getting slightly better muzzle velocity, but the accuracy improvement was the big difference I noticed. 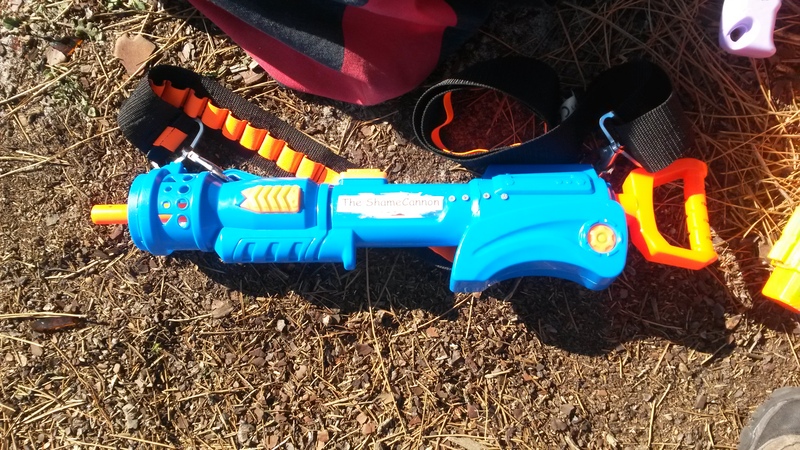 Elite Alpha Trooper (upgraded spring) – solid all rounder that’s very easy to use, though compared to flywheelers and Pump Retals are rather outclassed. Could be used effectively, but often took a lot more effort than with say flywheelers. 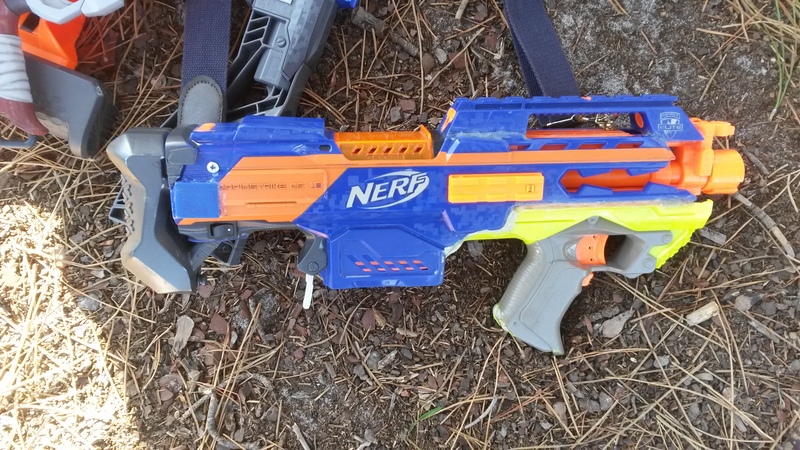 Fairly good as an entry level blaster. 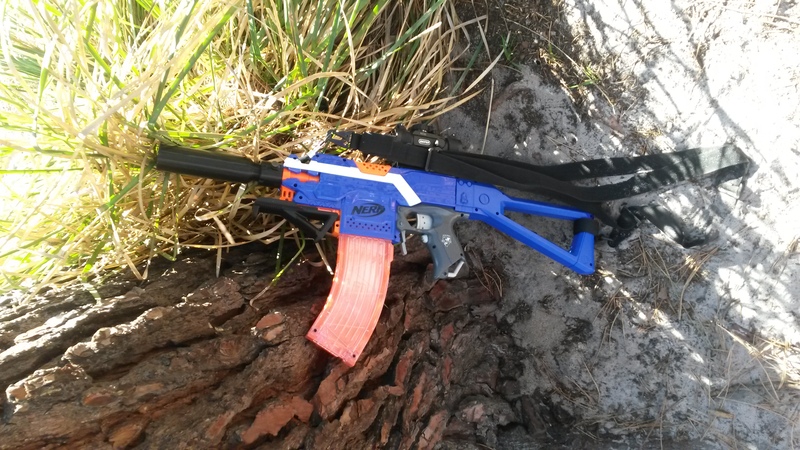 Elite Demolisher (MTB Honey Badgers, 2S LiPo) – tried it for one round before dumping it again. 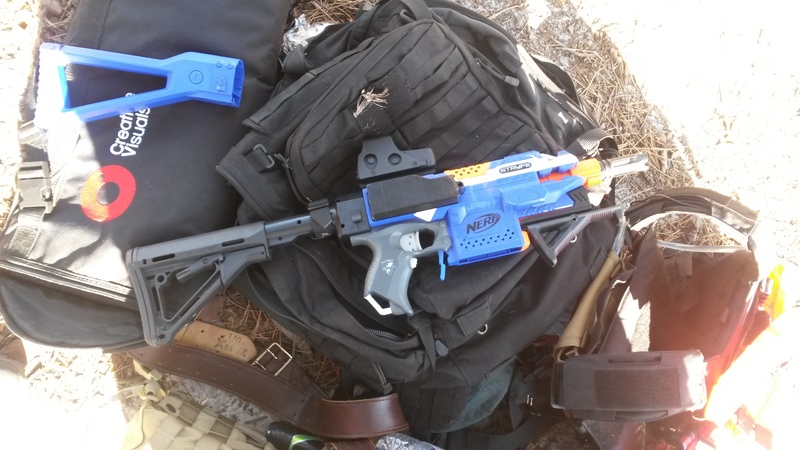 It felt far less accurate than my Bullpup RS, the spinup time was a little longer than what I’m used to and the noise felt excessive. 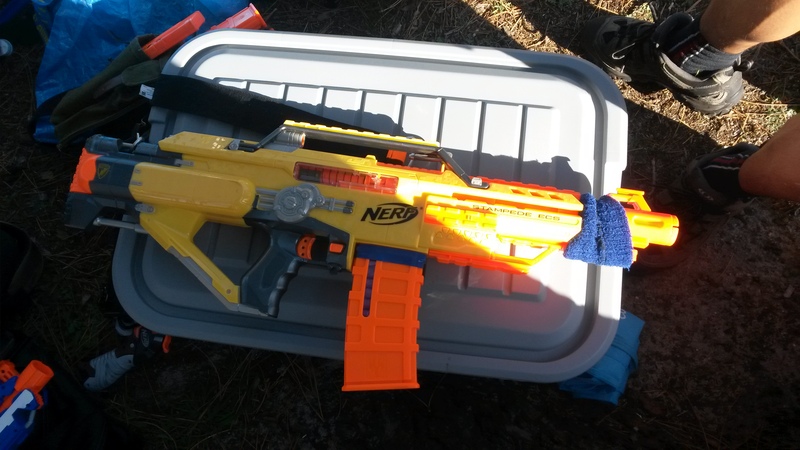 I think the accuracy problem is partly a flywheel cage issue and partly not having Worker flywheels, but overall was not happy with its performance. 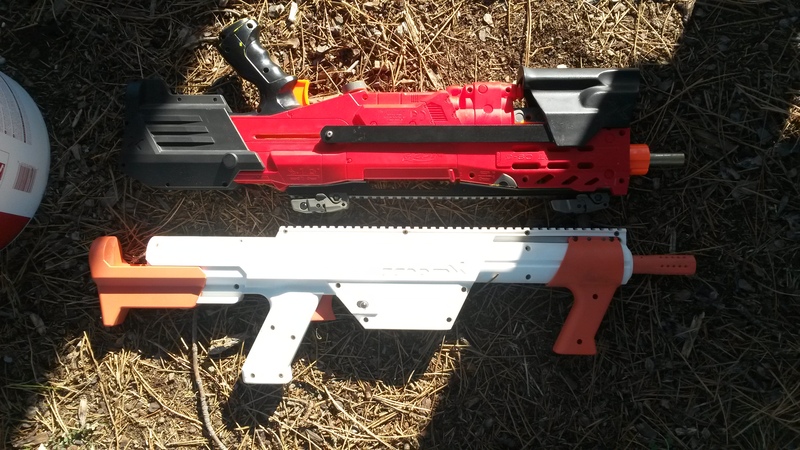 I feel like Honey Badgers are not an especially good 2S flywheel motor, stick with better established motors like “Banshees” or Blade 180s/3240s. 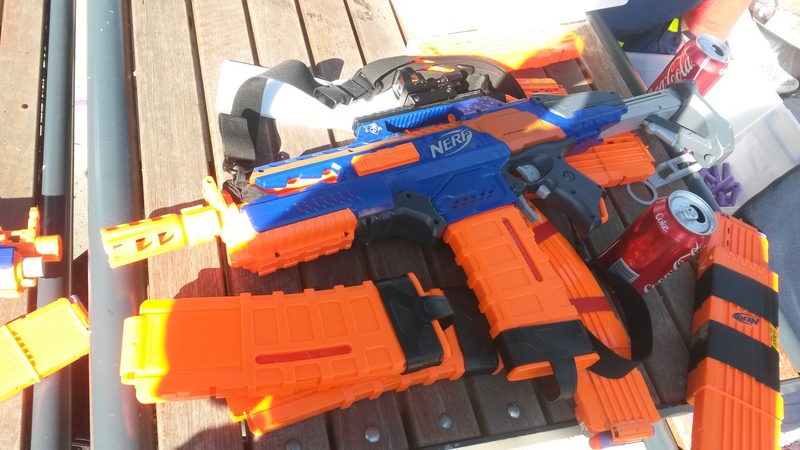 Elite Stryfe (various motors, LiPos) – very solid blasters, solid range, decent accuracy and good ROF. 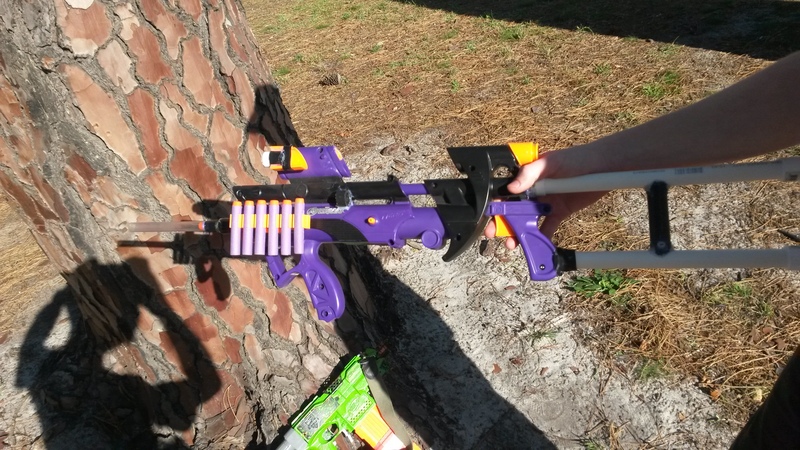 Less ROF than Rapidstrikes, but a lot smaller and lighter. 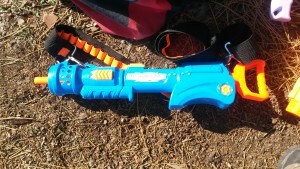 Easily the best entry level flywheeler, and arguably the best entry level blaster for this type of event. N-Strike Stampede (upgraded spring) – competitive in range compared to the flywheelers, but had a slower ROF. 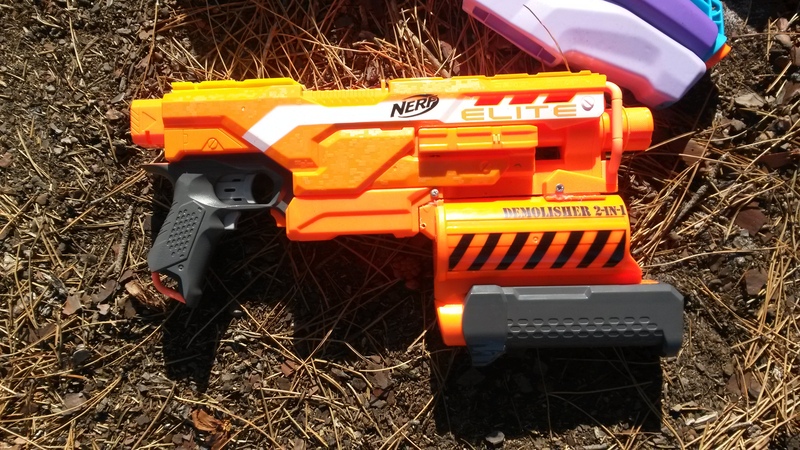 It did *work*, and is a little easier for a newbie to not screw up (no risk of shoving darts into stationary flywheels), but otherwised offered no real advantage over flywheeler autos. 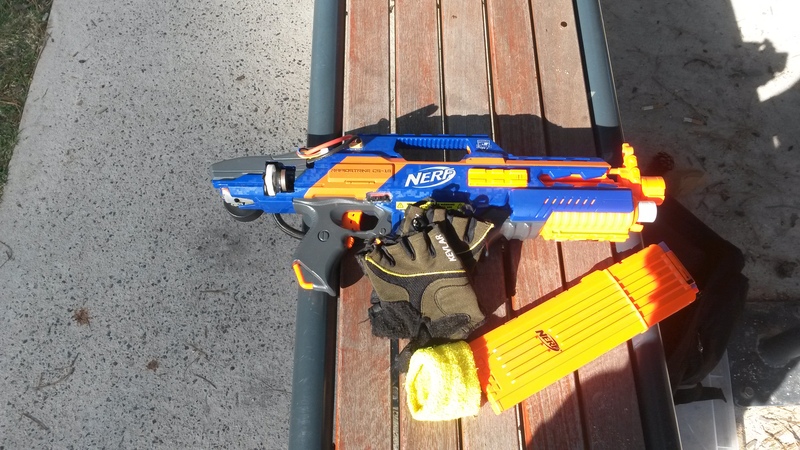 Elite Retaliator (upgraded springs, pump grips) – solid all rounders similar to but in many ways better than EATs. 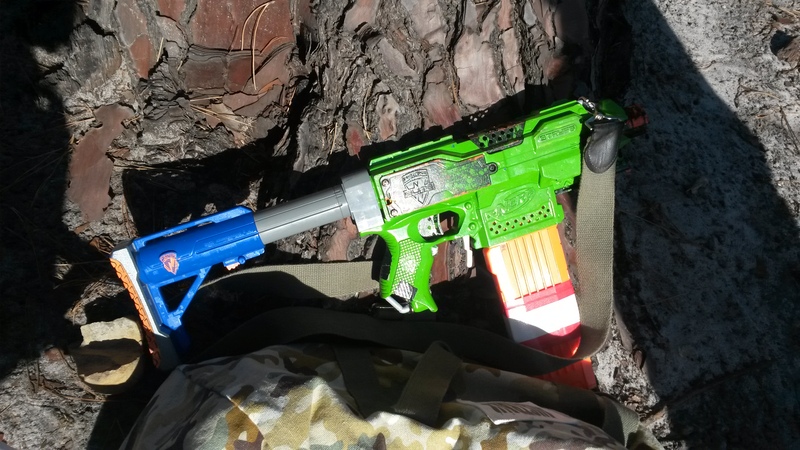 Superior internals and customisable pumps often make them preferable over the rarer EATs, but the cost of making one is far more than an EAT (assuming roughly retail price). N-Strike Longstrike (Extreme Blastzooka tank, air compressor, brass breech) – this thing was the closest to a sniper rifle present on the day. Excellent range, but the accuracy was not especially good (I believe due to a shorter than ideal barrel), and ROF was exceptionally slow. I think a well done Longshot is overall far more effective. 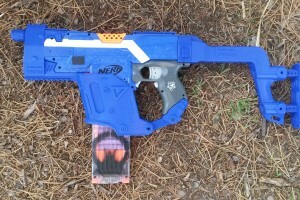 Zombie Strike Sledgefire (singled, upgraded spring) – a high power, blaster that is relatively easier to build than a lot of other high power blasters (e.g. a brass breeched or similar Longshot). ROF is exceptionally slow due to the reload process, but if well set up, has very good range and accuracy. Useful as a support blaster, but heavily lacking in direct combat. 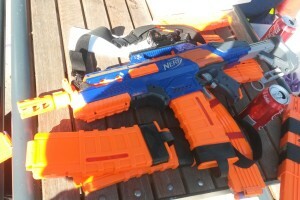 Might actually work well if paired up with a Stryfe or Rapidpistol as a secondary, though repeatedly switching blasters is a pain. 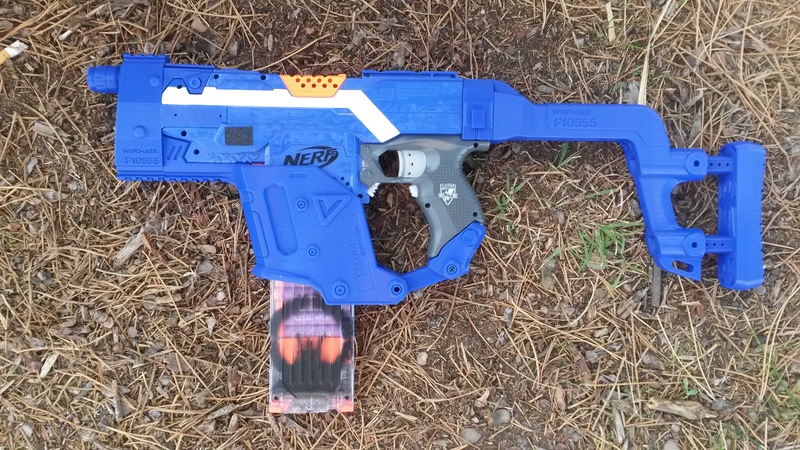 Buzz Bee Sentinel (brass breech, extra/upgraded springs) – this thing was a very good blaster, excellent range and a not-terrible ROF. 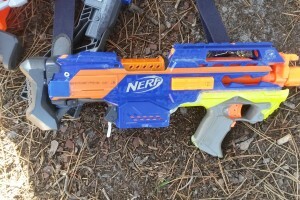 In close quarters naturally it’s at a huge disadvantage to flywheelers or pump actions, but much better overall than other long range blasters like the Longstrike above. 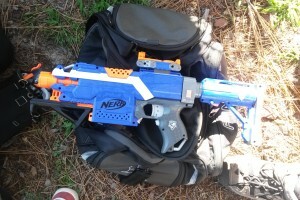 I was shot by it at pretty much point blank (I’m assuming through being mistaken for a live player when I was actually out and just filming), and it stung quite a lot for a good minute. 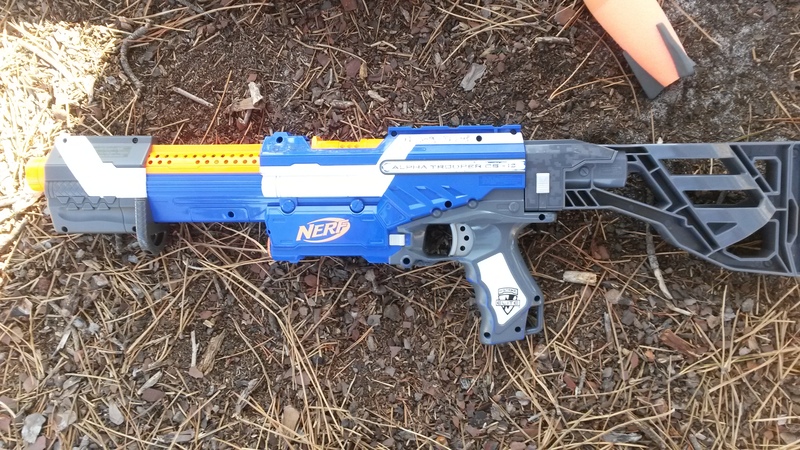 N-Strike Longshot (new breeches, upgraded springs, pump grips) – similar to the Sentinel above, these were excellent for long range potshotting, but couldn’t stand up to flywheelers or the smaller pump actions in close quarters. 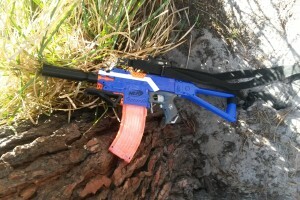 One was not used significantly as the user became lazy and switched to a Stryfe, and the other had some kind of internal issues, giving it suboptimal and inconsistent performance. 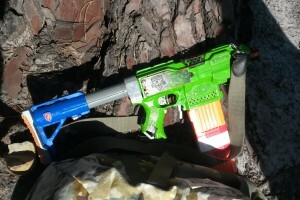 This was also my first time seeing in person and trying an Xmando. Though it felt quite tough and weight, I found the design to be exceptionally boring, more so even than a lot of Buzz Bee designs. 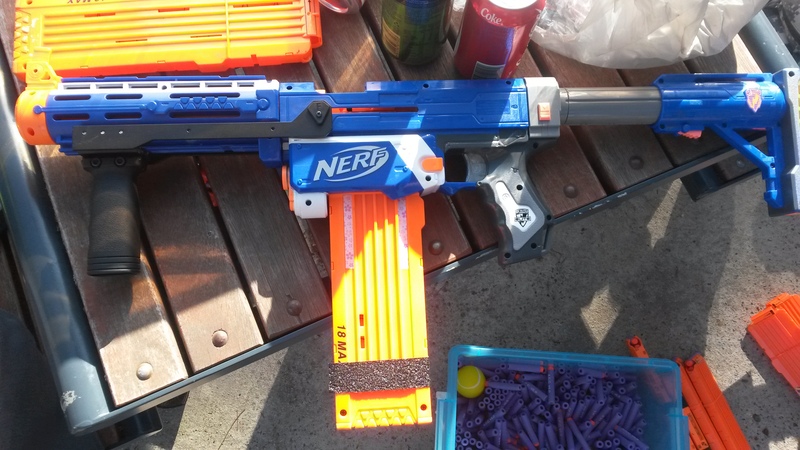 I found the stock to be almost unusably short, and despite the stiff prime, performance did not seem particularly good in my few test shots. This of course could be an internal issue with this unit rather than a design flaw, but honestly I didn’t like the shell at all. 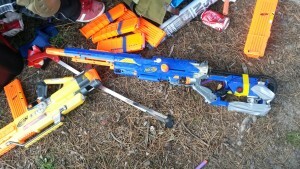 Nerf Big Bad Bow (extra spring, dart firing barrel) – much the same as the Sledgefire, although larger and more awkward to use. It had quite good range and accuracy, but naturally had an exceptionally low ROF. 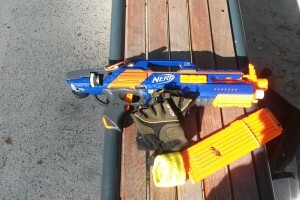 Useful for supporting fire, but not effective in direct combat or close quarters. 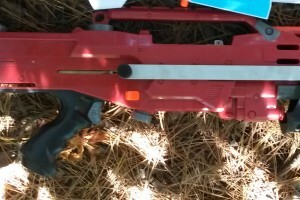 N-Strike Longshot (stock) – this thing only appeared as it was changing hands, but it was pretty cool seeing a complete red Longshot. 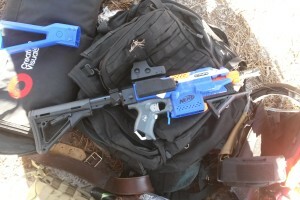 It’s new user used it for a couple of rounds and managed at least 1 hit with it, despite it being completely stock. We used the first play area this event. It has a lot of trees, but no significant bushes except along one border, and so is purely tree-to-tree combat and has no major “lines” of cover. Weather was not an issue, temperature peaked probably around 20C and the skies were clear, though the tree cover protects much of the play area from the sun. While there are generally enough trees for cover throughout the area, the north western area near the path is quite sparse, with just a single sparse line of trees. This area is much harder to use, though is generally not a big problem. Personally I think I prefer the second play area due to the greater density of cover, especially some particular large shrubs. Player count peaked at around 14 or 15, a little more than previous games. 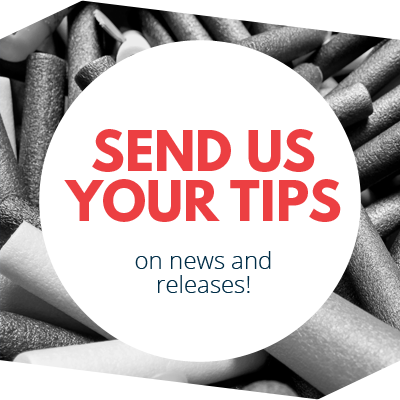 MLF also received an extra batch of darts, which was very helpful. This reduced the number of necessary dart sweeps to just two – one mid event just before lunch, and one at the end of the event. In previous events, darts sweeps were sometimes after every 2 or 3 rounds, as the main dart box was quickly depleted and players were running out of ammo. We played a few rounds of Kill Confirmed, and they went pretty much as expected. Short, intense and simple fun. 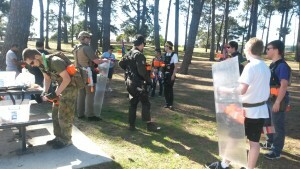 Since the play area and spawn points used lent well to two main front of combat, the teams typically split into two groups. As usual, the winning team is typically the one that is able to eliminate one portion of the opposing team, and take control of one side of the play area. As we played KC with smaller player counts while waiting for others to arrive and load up, downing even just two players meant a significant portion of a team. In the one KC round I have recorded, I was able to quickly down the two enemies on my side of the area, while getting downed myself in the process. Since my side of the play area was clear, I was quickly revived by a teammate, proceeded to eliminate the two downed enemies, and by that time the enemy team had just one player left, who was quickly eliminated. The early stage of the round could easily have gone either way – a stray dart here or there and suddenly a hit becomes a miss, or a miss miraculously becomes a hit. With a bit of bad luck, I could have been downed before hitting either player, which would probably have resulted in defeat for my team. I didn’t see anything of what happened on the other side of the field though, it could have been that my team was doing really well regardless. That is pretty much Kill Confirmed in a nutshell though, a bit of strategy does a lot, but given the fast paced nature of the game, so does a bit of luck. We played a number of Capture the Flag rounds. Most of them went about as expected, although one particular game went rather unusually. In this particular long game, both teams had pushed quite close to the other teams’ flag. My team had progressed through the north end of the play area, while the other team had pushed up along the south. My team was the first to actually push through and steal the flag, however before we could return it, the other team managed to steal ours. As a result, the flags ended up being brought all the way to the spawn points, which naturally resulted in a horribly long stalemate. It’s literally impossible to push into the spawn area to steal the flag, since any defenders can just sit on the spawn point and be effectively invincible. Eventually the respawns were reworked for this situation – every player had just one more respawn, after which they would be eliminated from the game. Medics could still revive of course. This mechanic led to a bit of a back-and-forth fight as players ran back to respawn or were eliminated, eventually resulting in both teams having just a few surviving players. The enemy team was actually able to retrieve both flags and get them very close to their flag post (within about 5 metres), but were eliminated at the last minute, and so my team actually won through elimination rather than flag capturing. This mechanic was slightly altered and turned into a rule for the remaining CTF rounds, being that if both flags are stolen, the game becomes a sudden death. This is somewhat awkward and turns the game basically into an elimination game, which I’m not a huge fan of. I believe a flag exclusion zone around spawn would work better, something like the flag cannot be brought within ~10 metres (or some other reasonable distance or area) of spawn. Additionally, I believe that the flag should only be dropped if the player carrying it is downed, and so should otherwise always be in the hands of a player, or in its appropriate flag post. Among other things, this would help to solve flag hiding issues. If the flag bearer chooses to hide, then their team effectively loses one player, giving the enemy team the upper hand numerically. If they choose to engage in combat, then it is clearly obvious to the enemy team where their stolen flag is, and so where they should attack. All the other CTF rounds went about as expected, taking only a couple of minutes each and each ending with a clean flag capture. Like usual, the two teams would generally engage each other on two fronts, one down the south end and one through the middle. I typically play very aggressively and always sprint from the start, so I am always one of the first players in position. When spawning in the south west corner, I would usually push up along the south as it is closer to my spawn and offers generally better cover as it has more trees. This cover allows me to better push up to the south east corner, just below the flag, from which I can potentially sprint out and steal the flag. The problem for moving along the south edge is that you are easily fired upon from the middle, and the flag is slightly harder to return as the flags are in line with each other through the middle. When spawning in the north east corner, I usually push up through the middle as it is much easier to reach from spawn and is usually directly in line with the enemy flag. From the middle, I have a (slightly) better view of the area, and due to being slightly uphill, can also provide slightly better suppressing fire. However the middle is much more exposed, and especially can have trouble advancing against particular groups of trees that offer longer ranged blasters an excellent defensive position. Being that I am almost always playing quite aggressively, I tend to get a fair few hits on enemies, but also get hit a lot. By virtue of my speed, I’m always able to get back into combat quickly, and also make a lot of attacks at the flag. I ended up making a number of flag captures, I recorded at least 3 successful flag thefts and returns. I couldn’t have made most of these runs without the help of teammates, as when running the flag, I focus purely on running and almost never try to engage, and so must rely on teammates to hold off any pursuers. In particular, there was one run where a few enemies were able to get between me and my team’s flag post, and I only survived that run through the intervention of several teammates. Overall besides that one extra long round, CTF worked pretty much as expected. We played a couple of Black Hawk Down rounds, and they went similarly to the previos event’s games, however I think these rounds didn’t go as well. We had 14 players for the BHD rounds, so played with 5 SF v 9 Insurgents. Each team had one shield. The SF team was able to win once, with every other round going to the Insurgents. The SF started in the north west, while the Insurgents started in the south west. As with before, the Insurgents’ survival hinged on the survival of their medic. Without the medic in play, the SF would be able to easily blast through the Insurgents as they can all revive one another instantly, while the Insurgents get instantly eliminated. Because of the amount of combat going on and the general lack of cover, the Insurgent medic was always busy running back and forth reviving people. If the medic was unable to reach a certain group of downed Insurgents in time, chances are the SF team would be able to push up, eliminate the downed Insurgents and flank the survivors. As with the other game types, the teams usually split in two, with one group fighting through the middle and the other along the south edge. Given the general lack of cover outside of particular lines and groups, the two groups are usually confined to quite narrow lines of attack. For instance in the game where I was on the SF team, three SF players (including me) and about 5 or 6 Insurgents had a firefight along the south edge. The lack of cover made it such that pretty much all 8 or 9 of us were in line, and it was total chaos. We eventually were all downed through sheer volume of fire, though not before some pretty cheesy revive chain tactics in a desperate attempt to survive. This is in contrast with the second play area, where the Insurgents were generally able to attack along the entire width of the main play area, which felt much more like a defence game. In the one game where the SF team won, they actually won by drawing a significant portion of the Insurgents out of cover, then eliminating them and pushing up to wipe out the remaining Insurgents. Instead of engaging along the middle or the south, most of the SF team stuck to the northern most tree line. This tree line starts near the north east spawn and runs along west, but does not quite get to the western flag. Additionally it is quite far north of even the middle line, so is rather hard to attack from, but quite easy to defend. Several of us Insurgents decided to attack this northern line from the middle, and due to lack of cover and the significant distance to cross, we were all downed quickly. Since we were quite far from the other Insurgents, and were downed out in the open, it was pretty much impossible for the medic to reach and revive us. The other group of Insurgents were not faring too well either. Although they managed to down an SF player, they were unable to eliminate them, and eventually the SF team were able to push back and eliminate the remaining Insurgents. Besides this positioning and baiting, this SF team was also extremely well coordinated and were constantly moving back and forth and covering one another, making it very difficult to isolate and eliminate any one of their members. A bit of luck probably also played a part, given the inherent inaccuracy of darts and blasters, and the fact that one of the other SF teams had a similar position, but were eliminated. I personally feel that the denser and wider cover of the second play area works much better with BHD, as it doesn’t encourage funneling of players quite as much. The significant funneling of players into lines of cover turns the game into a tree to tree spamfest, with neither team having much opening to push forward without significant luck. The denser cover of the second area allows more progressive combat along a wider area, and gives a much better environment for this sort of assymetric offensive/defensive game. The balance of roughly 2 Insurgents to 1 SF works reasonably well I think, there are enough SF players to offer them a decent chance of victory, but enough Insurgents to make it a challenge. Finally we played two VIP games, and both of them went terribly for my team. Not due to balance issues or anything, more just very poor communication, coordination and awareness. In the first round, we had our VIP picked, but didn‘t have our medic chosen until *after* the game had started. 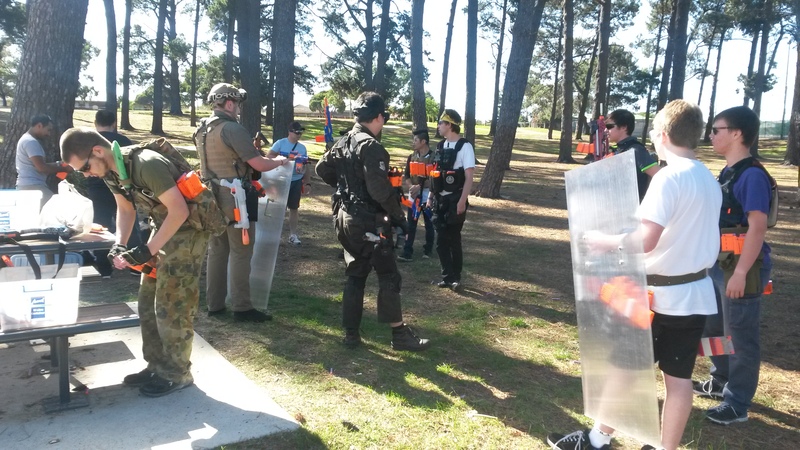 About half of the team was not really paying attention or really into it at that point, and by the time everyone had actually realised we were in combat, most of the enemy team had moved up along the middle to flank and attack. We were in a very bad position, and our VIP was one of the first, if not the first player to be taken out. Naturally from there the rest of us were wiped out pretty fast. In the second round, our team was more prepared but still not that well coordinated. Furthermore, our VIP decided to engage in front line combat, which was a very poor decision. While I was rather successful attacking along the south edge, the rest of my team was apparently less successful, and when I went back to respawn I found our VIP taken out. As it turns out, our VIP was lost relatively early, but whether due to the intensity of combat, my distance from him or something else, I didn’t hear him announce his defeat. Several of my teammates kept going back to respawn despite our VIP standing right there, out of the game. Given that these were the last games of the day, a fair few of the players were probably tired by then and sort of out of it, so the exceptionally poor coordination and communication is perhaps not much of a surprise, but it was a little annoying to be out of the game so quickly. I guess that is the punishment for poor coordination and VIP choice. The shields were used in this event a lot, and performed much as previously, with a few more weaknesses. In the second play area with a lot of dense cover and a relatively narrower area, it is very easy for shields to protect their own flank with cover and advance with minimal fear of flanking. Additionally, since noone had grenade launchers, everyone had to rely on throwing grenades, which is very difficult to do when under fire. In contrast, in this play area with a lower density of trees and a wider play area, shields are very vulnerable to flanking. 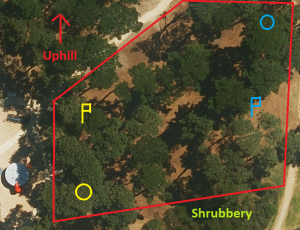 Although they can just as easily duck behind a tree and turn their shield to hold off the flanker, the abundance of open space around the play area made it much harder for shields to just advance at will. In this event I witnessed a lot more shields get forced back due to the threat of flanking than in the second play area. For the most part though, thrown grenades were still not very effective as they are even easier to dodge with all the open space, and are almost never thrown particularly well due to the stress of being under fire. However, those of us with grenade launchers saw more success in 1v1 against tanks. I personally achieved two separate shield hits, which in the new rules renders the shield unusable for the rest of the game. 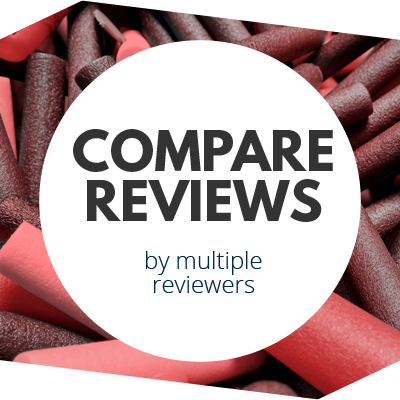 The ability to fire off a grenade with good range and accuracy at a moment’s notice is far, far superior to trying to throw a grenade, especially when under fire. In one of the times I got a successful shield hit, I was engaged in a 1v1 with the shield, and likely would not have been able to throw a grenade accurately in that situation. The presence of grenade launchers along with the updated rules significantly reduced the shields’ effectiveness, and I think they’re at a good spot currently. They’re still extremely powerful of course, but the threat of permanently losing the shield as well as the increased effectiveness of grenades with launchers makes it much harder to just charge forward or set up, which was something that happened annoyingly frequently in the previous event. The shields and shield balance is at a good spot now I think, and the gamemodes are all in pretty good places. I think a few more events refining the details of some of the gamemodes would be good, but besides that MLF is a pretty good group to have games with. This entry was posted in Game Reports on April 20, 2016 by Outback Nerf.